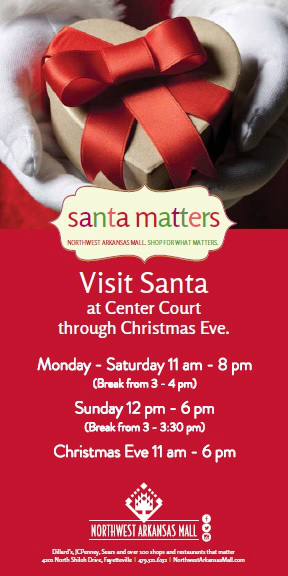 Disclosure: This blog post was compensated by the NWA Mall and its management company. All opinions are my own. I love Santa. Let me just put that out there right now. I love seeing all the pictures of kids with Santa that I see from friends. Since we decided to not have children, I figured I would never get the opportunity to see my own kids in pictures with Santa. Last Monday, I got that chance. Northwest Arkansas Mall has a great new Santa’s Village that they created last year and the set is gorgeous. 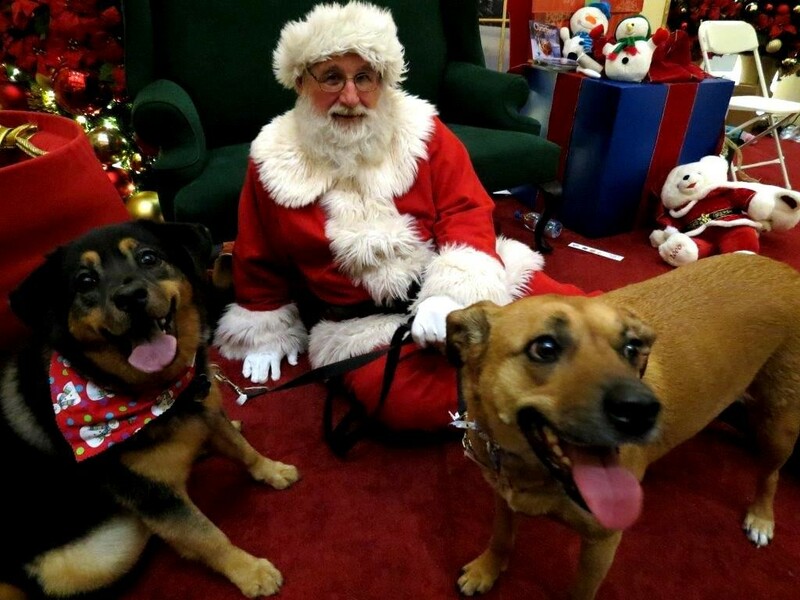 They also started Pet Nights with Santa and it was so successful that they expanded it to two nights this year. Smart idea! I took our dogs, Flower and Jazzy, for the first night December 7. I saw dogs of all sizes and breeds, cats, a bird rabbits, and my friend’s house pig. I took our dogs, Flower and Jazzy, for the first night December 7. I saw dogs of all sizes and breeds, cats, a bird, rabbits, and my friend’s house pig. The Smith Puppies were a little uncertain of the ropes, but they loved greeting all the different kinds of dogs we encountered while in line. I can’t tell you how psyched I was about this! Our dogs had pictures with Santa before but it was in a boring, white room and Santa was sitting on an ugly chair. Cute I guess, but just not the same. This set has it all. 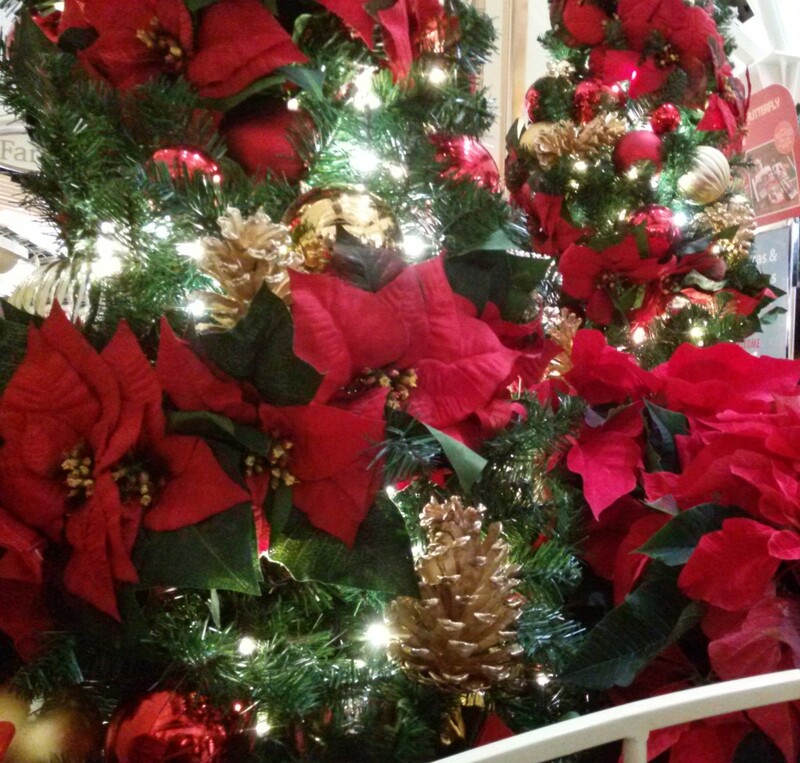 A fake fireplace with stockings, stuffed animals, a gorgeous couch for Santa to sit on, a giant tree, and poinsettias. I love looking at it every time I go to the mall. 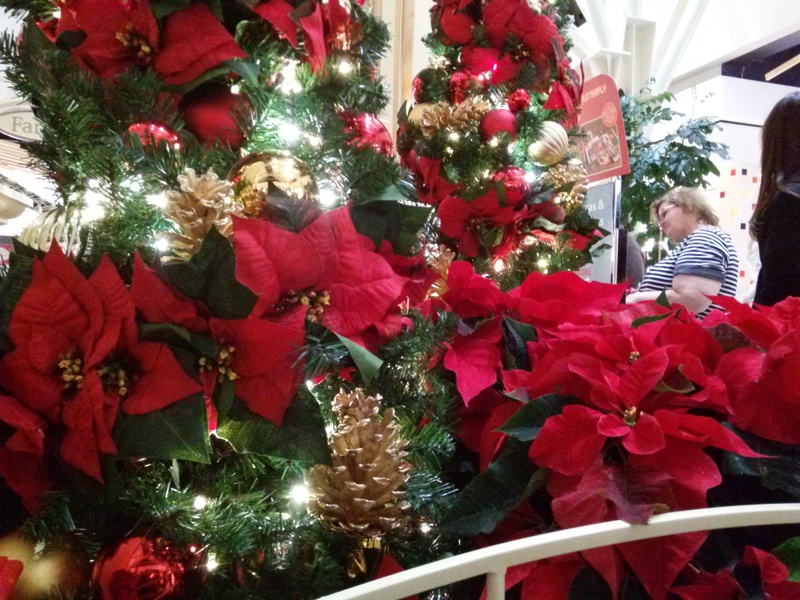 I love poinsettias. If my pets wouldn’t eat them, I would keep them in the house all Christmas season. There was no way to get the full tree in the picture. This tree is gorgeous! 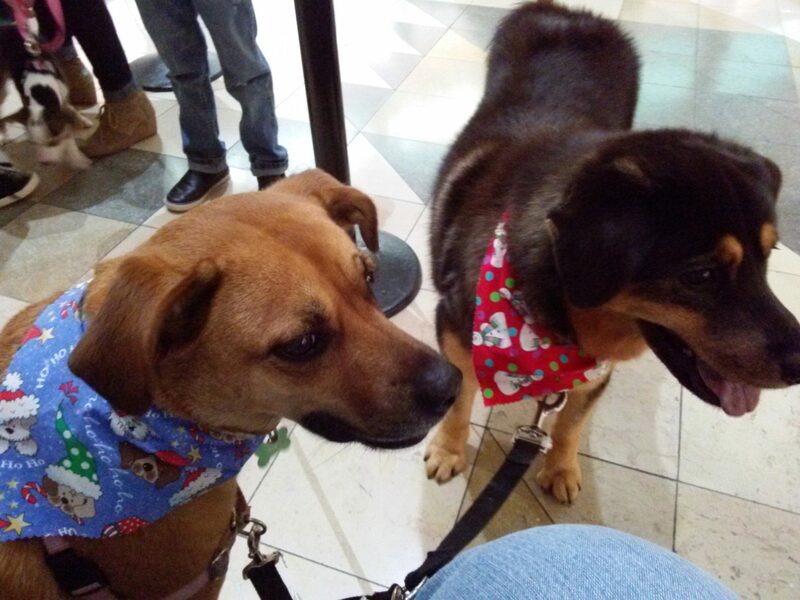 I’ll fully admit that I had the dogs groomed before their big night with Santa. They needed baths anyways and Flower needed her nails trimmed so why not just get a full bath done professionally? Besides, if human kids get cute PJs for pictures with Santa, mine were going to get cute scarfs. I’ll be honest and say that instead of the process going perfectly, my pups were more the type of “kids” to cry when they meet the Jolly Elf. For some reason, they freaked out and I found myself sounding like the mom from Home Alone when I told them they were the only ones to cause trouble! 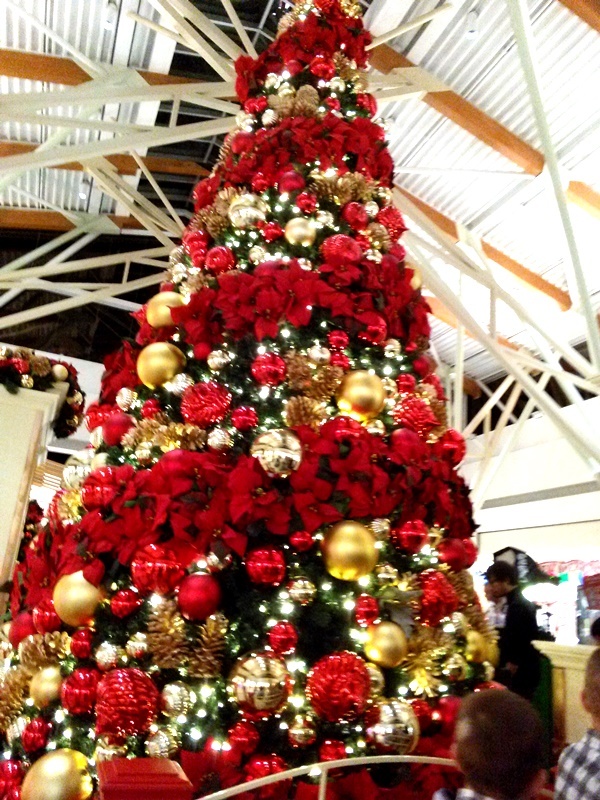 The mall Santa was amazing. The picture staff was amazing. They tried every which way to help get the dogs to cooperate. We didn’t get the perfect set of pictures, but the ones we got are cute. 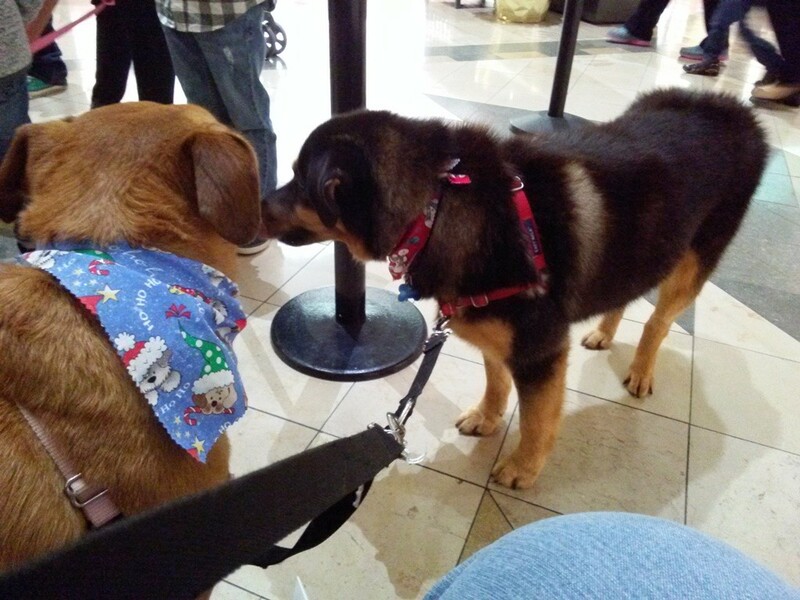 The couple of pictures we got show a kind, gentle Santa who got down on the floor to try calming my dogs. There is no doubt in my mind he would do the same for a child. The pictures we got show my dogs the way they are, which is goofy and a little nuts. But sweet. 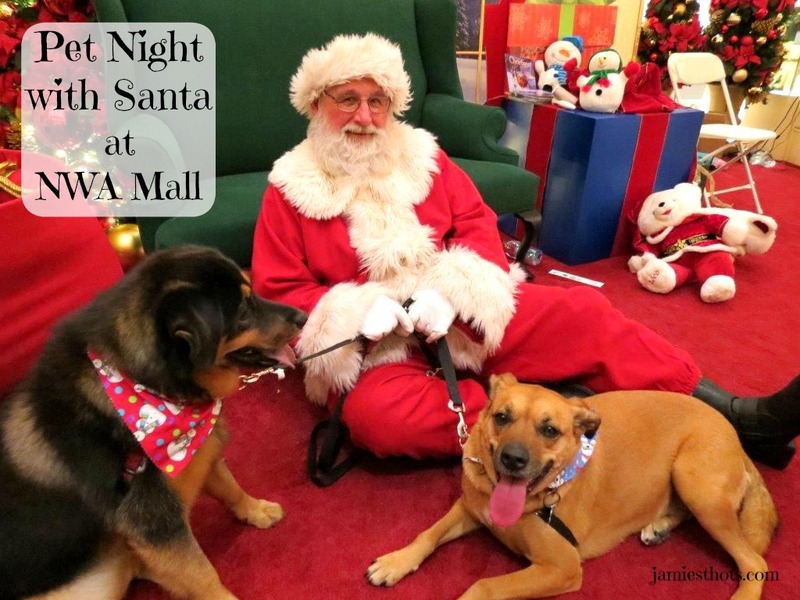 Northwest Arkansas friends, you have the opportunity to get pictures with your pets at the Northwest Arkansas Mall 6 p.m. to 8 p.m. Monday, Dec. 14. I suggest arriving a tad early because the line forms quickly. 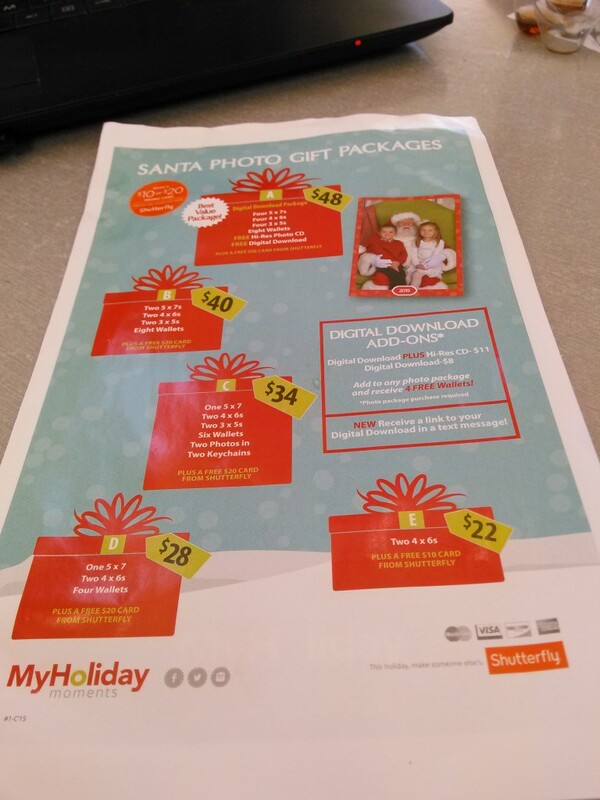 You won’t be allowed to take pictures with your own camera, but the photo company offers packages you can purchase at a variety of price points. Now, one more look at the Smith Puppies. Neither this picture or the first one were taken by the official photographer and so they don’t have the special frame and the lighting is slightly off. But it still captures the cuteness of the dogs and the sweetness of Santa!